Thank you so very much for your patience. 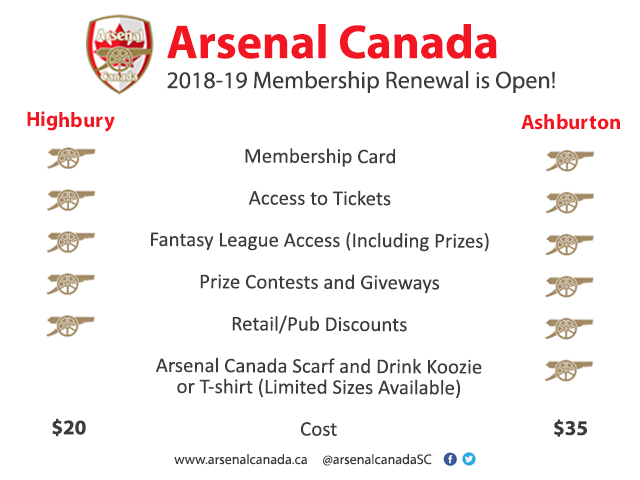 After much deliberation, and to lower operating costs this year, Arsenal Canada has decided to sell two tiers of memberships for the 2018-2019 season. Since almost 90% of members join to obtain access to tickets, this year’s memberships will continue to provide this benefit along with draws for free Arsenal swag throughout the season (including a team-signed kit!! ), fantasy league competition/prizes and group order discounts from Arsenal dot com. We are also in the process of negotiating with retailers for other discounts, and are hopeful to provide further information before the start of the season. If you have not been a member over the past couple of seasons we are still offering our stunning Arsenal Canada scarves, drink koozies and tshirts as long as supplies last. We appreciate your support over the years and as this is a volunteer run organization we have signed on some really top drawer Gooners to help us in this rebuilding year. We have successfully brought ourselves out of the issues we inherited and feel strongly that with your continued support we can make Arsenal Canada one of the top Supporters Clubs in the world. Since the tentative season schedule has been released, join now by clicking here and completing your membership application. Go Gunners! !